When I first saw this idea they were made to be put in the mail. A great idea for long distance grandmas. mailed as is! No extra wrapping needed. birthday pouch in their mailbox. I loved this idea but all of my grands live too close to use the mail. So, they have each received a hand delivered birthday pouch! All you need is a piece of card stock for your base. Birthday scrapbook papers and stickers. Fairly flat goodies to stitch up in the pouch. 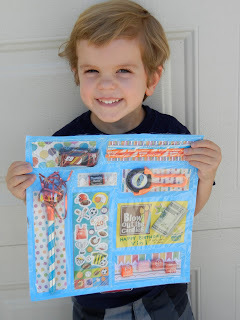 A DIY or store bought birthday card. Cash or gift card to insert in the card if desired. Create the page like you would a scrapbook page. Low tack tape helps to keep goodies in place. If mailing, address the greeting card. into the bag with the zipper at the top. card stock top edge. Trim other edges if needed. I'm getting quite a collection of leftover zipper bag tops. I'm certain they will be turned into a fun craft one of these days! Wouldn't these pouches be cute for holidays or back to school? I LOVE the presentation! It makes even ordinary little goodies seem magical. I am thinking these might be fun to hand out during "quiet time" when grandma is babysitting and needs a break (after the kiddies have outgrown naps!) They would have a ball cutting them open, snacking on the candy and working puzzles inside the books. Maybe even set up a scavenger hunt to find them?.....lots of cute ideas possible from this basic one...and I think Halloween packs would be terrific fun...what about "secret compartments" (hiding paper skeletons!) hidden beneath the toys? Cute, cute, cute! Where DO you get all of your ideas?